Posted on January 13, 2014 by bestteacherblog Posted in Elementary, High School, Middle School, Online Resources	. Sometimes it’s hard to find a good social studies website that is focused on the topic you’re teaching… There’s so much “stuff” out there to sort through, review and fact-check. So, I spent the better part of a month scouring the deepest depths of the interwebs looking for quality online resources in hopes that I’d save you some time and energy! 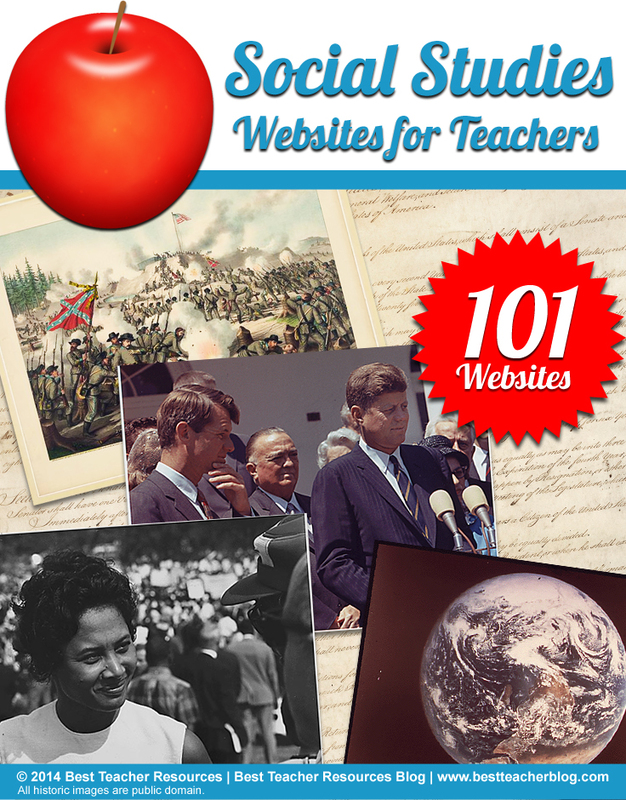 If you know of any useful social studies sites that aren’t included on this list, please let me know! I’d love to add them to this list. These historical and political cartoons make great discussion starters or classroom warm-ups for U.S. history lessons. View digital versions of the nation’s most important historical documents. Use the easy-to-read text versions of the United States’ most important documents to familiarize your students with the words that shaped the government and culture of their country. Over one hundred Civil Rights Era clips from the NBC News archive including segments like Separate is Not Equal, Buses and Boycotts, Freedom Fighters and We Shall Overcome. The Zinn Education Project website is full of free downloadable U.S. History resources that are organized by theme, time period and reading level. Thousands of historical documents from the National Archives. 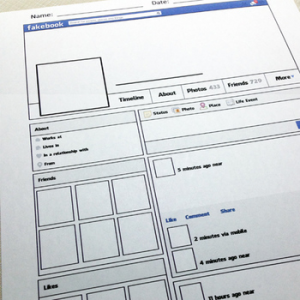 Plus, ready-to-use activities to pair with the documents. Search by historical era or make your own activity. These 100 documents chronicle United States History from 1776 to 1965. You can view a digital copy of each document and also read an excerpt that gives background information about the document. A full range of activities and resources to support the teaching of landmark cases such as Marbury v. Madison, Brown v. Board of Education, Dred Scott v. Sanford and more. An enormous collection of historical memories, prints, photographs, newspapers, sound recordings, films, maps, manuscripts and more. Charters of Freedom is another website that allows you to view digital versions of the nation’s most important historic documents. This collection of images from American History includes the 18th, 19th and 20th centuries. The majority of photographs are of presidents, the White House, iconic people and events from our nation’s past. A database on major constitutional cases heard by the United States Supreme Court, with multimedia resources including digital audio of oral arguments. Search through pages of America’s historic newspapers from 1836-1922 or use the U.S. Newspaper Directory to find information about American newspapers published from 1690 to the present. American Rhetoric is an index of over 5,000 textual, audio and video versions of public speeches, sermons, legal proceedings, lectures, debates, interviews and more. History and Politics Out Loud is a searchable multimedia database that contains important audio clips from American history and politics. Did you know that the U.S. Constitution has only 4,400 words? It is the oldest and shortest written Constitution of any major government in the world. Find out more interesting facts at Constitution Facts! An online version of the United States Holocaust Memorial Museum’s exhibitions on Rescue and Resistance, Anti-Semitism, Propaganda, Persecution, Camps, the Aftermath and more. Chronicle of Revolution provides students with a detailed look at the events that contributed to the start of the American Revolution by reading newspaper articles from key cities. 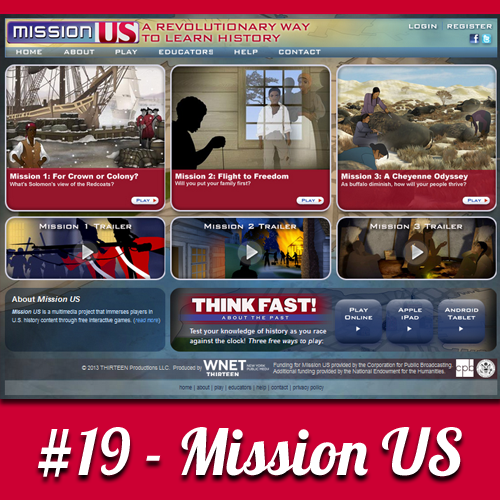 Mission U.S. is home to three free, interactive U.S. history games. One focuses on the American Revolution, the second focuses on a slave’s quest for freedom and the third focuses on how the railroads affected the natives. A demographic history of the United States dating back to the first census in 1790. It includes maps, information on population growth and distribution, ethnicity, age, home ownership, education, occupation and more. FedFlix features the best videos produced by the United States government, from training films to historical documentaries. An interactive map/timeline/infographic hybrid that is packed with cool facts about the Civil War. It’s got over 2,000 likes on Facebook! Entertaining games and animations covering topics including checks & balances, federalism, popular sovereignty, separation of powers, Bill of Rights, Preamble of the Constitution, American symbols and more. Crash Course’s YouTube Channel currently has 40+ quality videos that cover topics in U.S. history such as the American Revolution, Constitution, Slavery, Civil War, Civil Rights, and more. If you’re unfamiliar with this YouTube channel, you should definitely check it out! 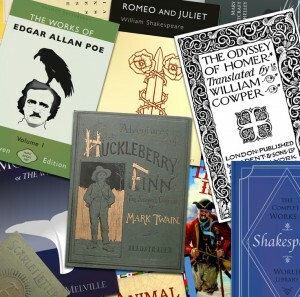 FYI – some of the narrator’s humor may be unsuitable for younger students. Collaborate using social technologies to delve into the past, present or future of city spaces. View architectural maps of some of the world’s most famous cities from different time periods and overlay important structures. View some of the most interesting and thought-provoking photographs through time to stimulate discussion in your classroom. The European Virtual Museum is an online collaboration between twenty-seven prestigious European museums and showcases historical artifacts from all over the world. TimeMaps is an all-inclusive look at world history that combines maps, timelines and chronological narratives. This online encyclopedia focuses on historical topics and figures from England, the United States, Russia, Germany and France. All of the articles are easy-to-digest and are written for students. Over 200 primary source materials about women in world history including photographs, propaganda, commentary and more. These materials are great discussion and essay starters. While HyperHistory’s design is reminiscent of websites from the 1990’s, it covers 3000 years of world history including culture, religion, politics and historical figures. 300 informational narratives and 10,000 events in a searchable database. HistoryWorld is great for conducting preliminary research for papers and projects. EyeWitness to History is home to first-hand accounts of historical events, vintage photographs, original radio broadcasts and more. Easy to understand descriptions of some of the world’s most influential civilizations including the Babylonians, Chinese, Egyptians, Greeks, Vikings, Persians, Romans and more. The history of the world—according to Wikipedia—told in plain English. Watch video clips from the History Channel on a variety of topics including the American Revolution, American Civil War, World War II, the Titanic, Black History Month, Ancient Civilizations and more. A modern-looking website dedicated to world religions, history and world geography. Each topic includes a separate page with information, images and links to relevant websites. Some pages even have videos. A collection of historical documents in law and diplomacy from 4,000bce to the present. It includes documents such as the Athenian Constitution, Magna Carta, Articles of Confederation, Civil Rights Act of 1964 and more. 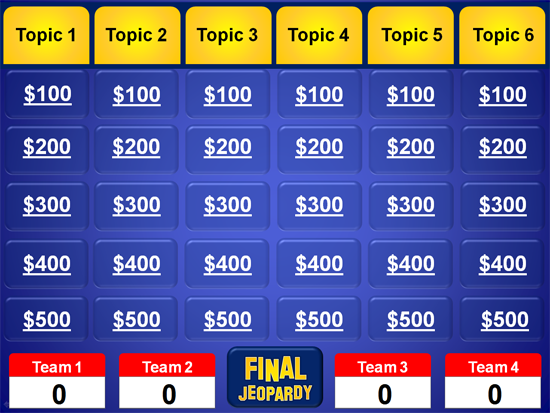 Playing History aggregates all of the free history games on the web into a simple, searchable database. Free documentaries produced by well-known educational publishers, including PBS and National Geographic. The available titles cover topics like the Battle for Midway, Alexander the Great, Pearl Harbor and more. World History for Us All offers teaching units, lesson plans and resources for middle school and high school world history teachers. It is a collaboration between K-12 educators, collegiate instructors and educational technology specialists. 26 thematic world history units include videos, an audio glossary and a database of over 1,500 images and maps. Use Bridging World History to teach your students about the ties that bind historical events together. Crash Course’s YouTube Channel currently has 40+ quality videos that cover topics in world history such as the fall of Rome, Alexander the Great, Ancient Egypt, Ancient Mesopotamia and the Agricultural Revolution. If you’re unfamiliar with this YouTube channel, you should definitely check it out! FYI – some of the narrator’s humor may be unsuitable for younger students. See how your views match up with those of major political candidates. Learn their stance on topics like abortion, economy, guns, health care, immigration and more. The official website of the Center for Information and Research on Civic Learning is home to information on the civic and political engagement of young Americans. There are a lot of cool graphs and charts that will get your students excited about fulfilling their civic duties. The official website of the White House. Watch the weekly address to stay informed on the most important events in our government. This website teaches your students how ballots and voting systems have changed over the years in response to political, social and technological change. 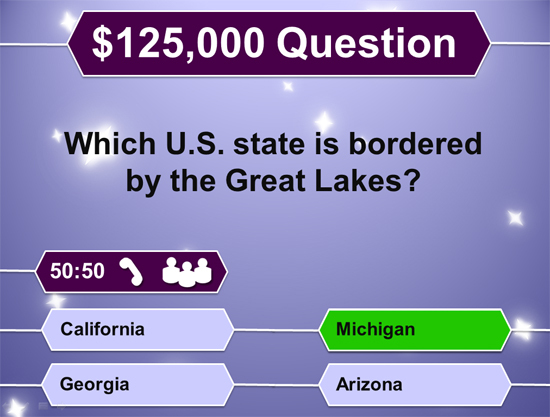 The web’s most popular free geography game. Over 51,000 people have “liked” it on Facebook. An award-winning website that hosts hundreds of short, guided video tours of the most famous cities throughout the world. Neat interactive maps to review Geography – requires flash and shockwave player. Google Earth is a nifty tool that is being used by educators around the world. It puts the planet’s geographic information at your fingertips and can be utilized in a variety of educational activities. There’s even a helpful Google Earth for Educators Community where you can go for new ideas or to share some of your own. A guide to culture, customs, social, business and study abroad etiquette for every country in the world. The information posted in each country guide is submitted by people who are either natives or residents (or former residents) of the featured countries. Free printable maps of the world’s countries. Each map is a blank outline. Free, printable 1-page maps, printable large-format maps and an online interactive student map. Animated socio and political maps of 18th and 19th century United States, Europe, Latin America and Africa. Animaps letting you create maps with markers that move, images and text that pop up on cue, and lines and shapes that change over time. Your finalized Animap appears like a video that can be played, paused, slowed down and sped up. Easily draw on Google Maps and then share with your students or post to your teacher blog. QuickMap’s slogan is “Doodle on Google!” It’s another free and easy way to draw on Google Maps. High-quality historic, thematic and topographic maps of the world including Africa, the Americas, Asia, Australia/Pacific, Europe, Middle East, Polar regions, Oceans and United States. This website takes important places and events, and overlays them onto a map. Just type in a zip code. Use it to show your students how large something like the Great Wall of China or the battle of Stalingrad really is/was! All you need is a valid email address to create interactive timelines that can be shared anywhere on the web. Easily create stunning web-based, sharable timelines with images and video. Tiki Toki also has a group editing feature for collaboration. View today’s front page from more than 800 newspapers worldwide. Use this website to demonstrate how different cultures can perceive the same event. A daily compilation of editorial cartoons from around the world that cover current issues and important figures. Modern cartoons on a range of topics including individual liberties, global warming, lobby reform, congress and more. 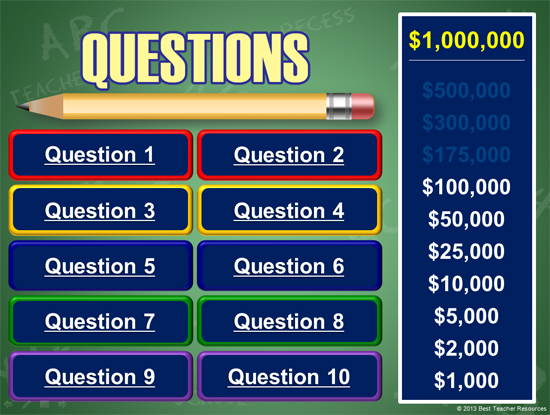 Sort economics and personal finance lessons by grade level, lesson type, concept, or standard covered. Econ Ed Link includes accounting, banking, budgeting, debt, inflation, interest, investing, risk and more. Numbeo is a website that allows you to compare information about the cost of living from different areas of the world. Use the Living Wage Calculator, developed by Penn State University, to calculate the approximate living wage of your area. The calculator lists typical expenses, the living wage and typical wages for the selected location. Enter in a U.S. Zip Code to get its latest U.S. Census data including detailed demographics. The CIA World Factbook contains information on the communications, economy, geography, government, history, military, people, transnational issues and transportation for 267 world entities. A listing of all of the flags from each of the world’s countries, territories and sub-national regions. Some of the listings also include basic information about the area. Find information about each of the 50 states, including the state bird, border states, climate, constitution, flag, population, state tree and more. Google Scholar is a simple search engine that specializes in scholarly literature. It allows you to search across many sources including articles, books, court opinions, online repositories, university libraries and more. Wolfram Alpha is searchable database of information about government, historical events, political figures, important documents and more. An inexpensive and quick alternative for clicker response systems. Create your first poll in 30 seconds without having to sign up. Your students simply text their answer to a predetermined number and, voila! 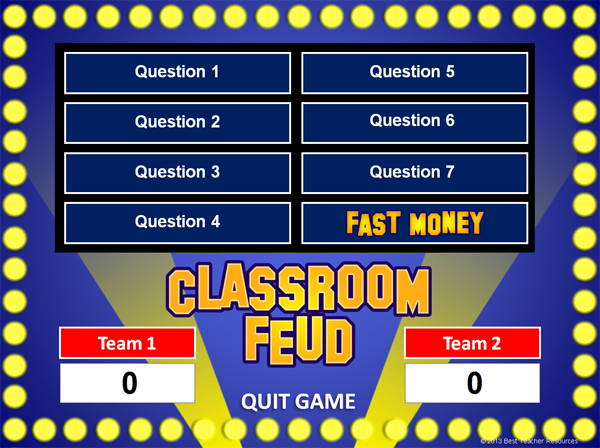 Poll Anywhere is free if your class size is less than 40 students. Show your class first-person views of different historic and cultural locations around the world. These amazing 360 degree panoramas are easily projectable on your interactive whiteboard, or perfect for your classroom iPads. BONUS: Check out the resourcesforhistoryteachers Wikispaces page. Blabberize is a fun web 2.0 tool that allows you to upload a picture (of a person—think historical figures! ), select its mouth, and make it talk by adding an audio file. Like Gizmoz, your students are sure to get a kick out of it! 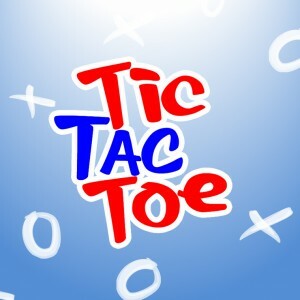 Online-stopwatch is a web-based stopwatch that is easy to display on an interactive whiteboard and can count up or down. Use it for timed exams, essays, and standardized tests. High quality lesson plans, activities and student resources for history and social studies, sortable by grade level. Primary source materials for Social Studies teachers. You can find thousands of grade-specific social studies resources on Teachers Pay Teachers. Just browse the Social Studies category or type in a search term for the lesson you’re teaching. Click here to check out my Teachers Pay Teachers store. Thanks for reading! I hope you came across some useful websites that you can use in your class. If you liked this post, don’t forget to share it with your friends using the social sharing bar on the left-hand side of your screen!!! What are your favorite websites for Social Studies teachers? Did I miss any? Let me know in the comments.